Canada is one of our favourite places to visit. It's not only one of the most gay friendly countries in the world, it also offers so much to LGBTQ travellers including large gay scenes, Pride events throughout the year, stunning landscapes, and of course many cute guys. 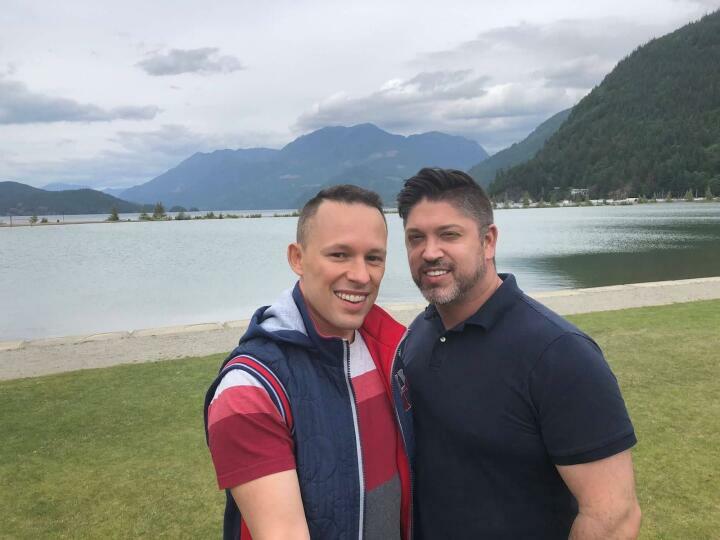 We met one particularly cute Canadian guy at the Whistler Pride event, who is not only a world famous renowned vlogger, but has since become Mr Gay Canada! Josh Rimer is proudly shining the rainbow flag around the world, so we just had to sit him down and get his word on what gay life is like in Canada. Hi guys, I’m Josh Rimer, 41 years old. I grew up in Red Deer, Alberta, now living in Vancouver in British Colombia with my fiancé Heath. 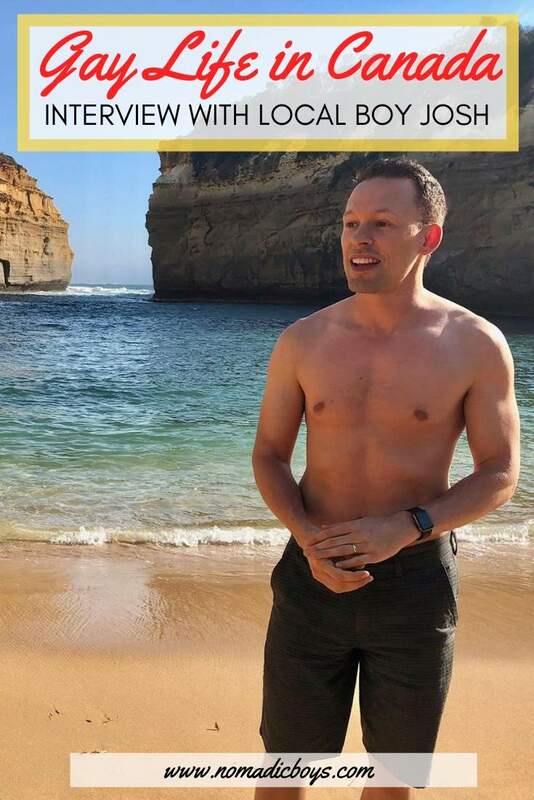 I’m a gay travel vlogger and also host travel content on our national LGBTQ television station that airs daily. This year I was also made Mr. Gay Canada 2019! What was it like growing up gay in a small town like Red Deer? I’ve been out for about 20 years now and luckily it was a much easier and more accepting process than I originally thought it would be. Canada itself is a very progressive country and Canadians are generally very liberal-minded, so I was lucky in that sense. But I grew up in the days before there was any talk about marriage equality and Red Deer was an area that was especially conservative. This was also just before the Internet so it was difficult to understand and accept that I could be gay. There were no openly gay people around me, so the only homophobia I saw or experienced was when kids would use gay slurs to put someone down, so I knew it wasn’t something there was a positive feeling towards. How did you meet guys growing up? I first started meeting guys online, shortly after the Internet went mainstream. There was a website where I could find other gay guys to message and chat with so that was how I initially met them. This was long before the days of Grindr etc existed, but it did the trick! Where are the best places in Canada for gay travellers to visit? Any of our major cities are great and ever since we got marriage equality in 2005 things have gotten much better in even smaller cities like Red Deer where there’s now a Pride week and even a rainbow crosswalk. The best gay scenes are in Vancouver, Montreal, and Toronto, each with many things to see and do as well as having large LGBTQ populations. Places around the province of British Columbia are especially great because you have Vancouver with its international airport and everything you could want in a big city like Whistler, Vancouver Island, and Harrison Hotsprings for smaller towns where you can still feel comfortable/safe being openly gay while enjoying the amazing scenery and wilderness in the area. 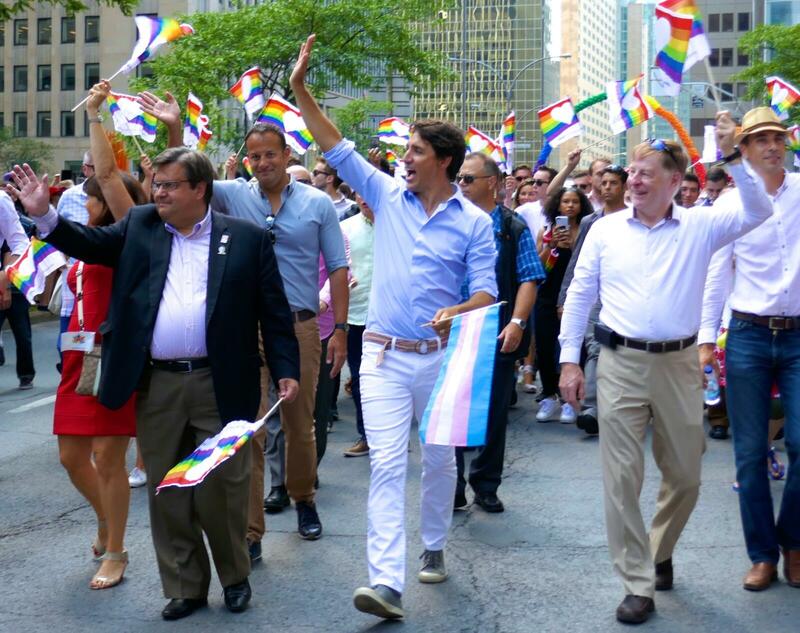 What is it about Canada that makes it so gay friendly? There’s a pretty laid-back / progressive / liberal / open-minded attitude overall in Canada. Then when you add in things like 14 years of marriage equality and our Prime Minister walking in Pride parades, I think Canadians have been able to both get used to and even embrace the fact that there’s nothing wrong with being gay. Which are your favourite places in Vancouver to go for a gay night out? I like to go to Pumpjack, which basically has a bar with seating one side and a dance floor on the other. I also love Junction, which hosts drag and improv shows among others, and Numbers which plays fun/campy music with a diverse crowd. Where would you take your boyfriend for a romantic weekend in Vancouver? Typically we might go somewhere else in BC outside of Vancouver since you could get to a variety of smaller/quieter spots by car within a couple hours (or ferry/helicopter). In Vancouver we might go for a walk along the seawall and around Stanley Park, followed by a hike along any number of trails in the area, then dinner at one of the many fantastic restaurants we have here. Or maybe check out something that’s currently happening in the city’s diverse live entertainment scene. What’s the best ways for LGBTQ travellers to meet gay locals in Vancouver? Going to any of the bars in the gay area along Davie St could be a good way to do it in person. Any underrated gay cities in Canada you recommend? Jasper is a beautiful town in Northern Alberta (about a 4 hour drive from the city of Edmonton, which has an airport). Even though they only have a few thousand residents they have a Pride week and feel very accepting of the LGBTQI community overall. Heath and I actually took a train ride there last year from Vancouver, which was an incredibly beautiful journey and we really enjoyed our time there – I’ll likely be going back again this year for Pride! Which are the best gay events + parties in Canada? Any Pride festival is of course a great option and every city has one (plus even some towns). Also, every major city has an event with former Ru Paul’s Drag Race contestants at some point or other so those are always fun to check out too! 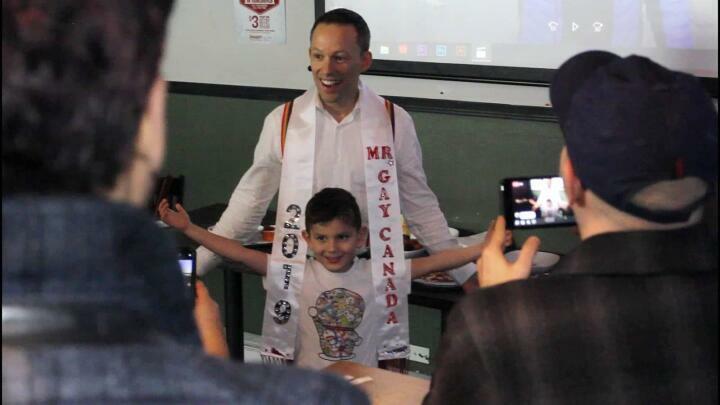 What was it like being crowned Mr Gay Canada? It was pretty surreal and quite an honour! They choose someone from the community that they think would be a good representative for Canada at the Mr. Gay World competition and I was the one who was lucky enough to get the title for 2019! With being a bit of a public figure in the community because of my TV content, YouTube channel, and volunteer work, I guess they felt I was a good candidate. What does it feel like to prepare for the Mr Gay World competition? I am excited! I can’t believe it’s coming up so quickly… I’ll be getting there at the end of April so I don’t have much time left before it begins. I’ll be doing a lot of traveling leading up to that point so I’m sure it’s going to feel like it’s here in no time. I need to prepare a fabulous national costume and find a nice suit for the pageant part of the competition. There will also be some volunteering/activism-related activities and a number of interviews. And finally, what’s next for Josh Rimer? Run for Prime Minister? I’ll start with the goal of just meeting our current Prime Minister in person and then go from there! But in the short-term I have a number of travel plans lined up and I’m hoping to attend a bunch of Pride festivals around Canada, the US, and beyond during the year while I have this title! You can find out more about Josh on his blog and watch all his weekly videos on his terrific YouTube channel.